The perfect twist on a perfect holiday pie! 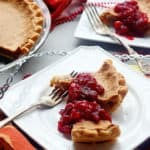 This Maple Brown Butter Chess Pie made with Safest Choice Eggs and topped with a simple cranberry sauce will be a favorite for years to come! Beat browned butter, sugar, maple syrup, Safest Choice eggs, cornmeal, vanilla and vinegar together in a medium sized bowl using a hand mixer or in the bowl of your stand mixer until well combined. Pour batter into prepared pie shell and bake for 35-45 minutes. Cool for at least 4 hours and serve.